Arrival at the archive of the Austrian Film Museum. No, not in Vienna, in the centre of town, with the splendour of the State Opera and the Albertina, but rather in the suburbs, in Heiligenstädter Strasse, among grey council buildings. An extremely friendly reception, yet there are strict rules to the game: one is only allowed to eat and drink outside of the archive, historical documents on brittle paper belong in special acid-free covers, photographs and film reels may only be touched when wearing gloves. An order which has been stipulated. The present book is the preliminary end product of a first intensive reappraisal of the Austrian Film Museum’s Vertov Collection. Whereas the archive, or to be more precise, the photographic collection, usually makes available material on individual films or directors for the purposes of internal or external documentation and information, this collection is something quite special in several respects – it is the most extensive monographic collection and also one of the oldest, it directly testifies to the specific cinematic interests of the Austrian Film Museum and finally it corresponds in some areas to the actual estate, and what is more it comprises a number of originals. But then Vertov himself is a special case. His oeuvre presents just as many aspects and areas of work as it does media and working materials – poems written with red pencil, montage lists typed on carbon paper, published articles and manifestos in Soviet avant-garde journals, unpublished sketches and diary entries, personal photos, frame enlargements and photographs that document the process of shooting and working, film posters, reminiscences of contemporaries and letters. An order which arises in the archive. However, to return to the original scenario: the opening of the ‘shrine’. A metal cupboard, inside it dark green files, a typewriter, a wooden letter opener, innumerable folders with unsorted papers, letters and sketches, a couple of rolls of negative photographic film, an envelope marked Mikrofilme von: Dziga Vertov, Montagelisten zu Kinonedelja, Kinopravda, 4 Rollen (‘Dziga Vertov, montage lists for Kinonedelja, Kinopravda, 4 reels). Also on the envelope is the note: Offiziell nicht vorhanden (‘Officially nonexistent’). Clandestine material, as yet unidentified objects and dates, as well as finally an unexpectedly large number of originals (autographed manuscripts by Vertov, a couple of letters and ... Rodchenko and Stenberg posters!) – that is the stuff which the somewhat bolder dreams of the often rather dry historical film studies are made of. And at least by now two things have become clear: firstly, that someone has been at work before us, meticulously and precisely putting the different kinds of pictures and texts (not only those from Moscow and Vienna, but others too) into a certain order, repeatedly having to take precautions for reasons of the delicate political agenda in neutral Austria during the Cold War; and secondly, that the challenge of our own work thirty years later nevertheless – or perhaps precisely for this reason – might well consist, in the first phase, in completing the various registers of reappraisal (linguistic, factual and cultural knowledge) and then in the second phase in applying them ourselves. The intention was to make the collection publicly accessible. It would therefore only be possible to create a new order by building upon what was already given. It is presumed that there are three main locations and several smaller secondary locations (mainly private archives on former Soviet territory) where Vertov’s estate is administered. Immediately after his death in 1954 his widow Elizaveta Svilova and Sergej Drobasenko, who later became director of the Scientific Film Institute of the USSR sorted his estate. In her lifetime Svilova dedicated most of the writings and pictures from this ‘Svilova Archive’ to the CGALI/RGALI (Russian State Archives for Literature and Art) in Moscow, which today is in possession of the major part of the estate. Apparently she also had an active interest in stimulating the western reception of Vertov. Besides a collection pursued by Anna-Lena Wibom at the Svenska Filminstitutet (mainly photocopies of texts, but also frame enlargements and photos) the ÖFM today constitutes the third centralised source of Vertov research. A geopolitical order, which is analysed in the essay part of our book. 1. A listing was published in S. S. Ginzburg, ed., Iz istorii kino (Moscow 1959) pp 132-155. The administrators of the estate consequently became responsible for the first and lowest layer of order in the collection. 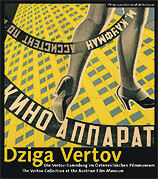 The ‘Dziga Vertov Archive’, created by Elizaveta Svilova, included the following sections: ‘Artistic and production work’ (film scripts, records, etc. ), ‘Essays, lectures, appearances and journalistic work’, ‘Official documents’ as well as ‘Photographs, newspaper clippings, letters and other documents’. (1) A second order was decided upon at the ÖFM during the cataloguing of the Vertov Collection in Vienna which was undertaken in the 1970s by the Slavic scholar Rosemarie Ziegler. Within the individual sections a historical-editorial and therefore strictly chronological approach was followed. Chronology as the first phase of all order. It was our task to re-order the objects in a twofold manner. From a conservational point of view they had to be transferred to high-quality transparent envelopes and files and had to be separated according to medium (negatives – photos – paper). The second transfer occurred when the objects were transferred into a database, which now comprises numerous further details in addition to all the criteria which the index already contained from the seventies (‘old’ signature mark – used throughout this volume, object title and date, as well as bibliographical references where necessary). Apart from a number of formal criteria (language, scope, format, medium, condition as well as information about whether the object is an original or a copy) the database refines the existing headings by using more exact descriptions of the contents (for example, ‘Vertov’s writings’ is divided up into articles by Vertov, interviews, editing lists and others; ‘documents’ such as authorisations, certificates, passes etc.). Not only do the objects themselves receive titles, but their contents are also being described, and in certain cases are attributed to Vertov’s respective films and projects and finally – probably the most significant innovation – commented upon in a separate field. While all the other information in the database has been entered and therefore ‘fixed’, the commentary will continue to be written in a kind of open dialogue. Here the various interpretations of the contents and even the different ways of dating and annotating can be recorded and then signed and dated by the respective authors. If, in the course of future Vertov research or the concrete study of individual objects, new evidence emerges, then alterations and corrections will also be made to the ‘fixed’ part. The aim is to ensure a determination of the objects that is as complete and definite as possible. For the further development of the database, which in the not-too-distant future will also be accessible online, the following details still have to be dealt with: the new section ‘V ÖFM’ should comprise all the documents and objects which concern the ÖFM’s study of Vertov, i.e. preparations for the Vertov exhibition of 1974, the exhibition objects themselves (textboards and display cases), the documentation of the exhibition (films, tapes, photographs), correspondence, German translations of Vertov’s writings, press clippings on retrospectives, etc. Some 500 new objects will be added here. Furthermore, the already existing databases of the collection of films, videos and books relating to Vertov will also be incorporated. The following catalogue presents individual objects as part of the aforementioned sections of the Vertov Collection. With a total of more than 2,000 objects under 13 headings at our disposal, the idea of making a selection seemed to suggest itself. We have tried to give as varied a presentation as possible, thereby taking into account the differing interests of readers and users, while still retaining an emphasis on the ‘cultural’ value of the collection. Since lists, tables, statistics and enumerations may easily be obtained from the database, we have taken the liberty of first of all providing a sketch of the individual headings and the respective selection criteria in a short introductory text, in order thereafter to present the selected objects of each section in the form of illustrations and annotations. The largest part of the presentation is taken up by Vertov’s writings, which include numerous autographed manuscripts. A further focus is on the photographs, most of which were previously unpublished. All the original posters of the collection have been reproduced. The final touch has been added by Edith Schlemmer, who for decades has handled that which without question represents the holy of holies of the ÖFM’s Vertov Collection: Vertov’s films. May the filmography that Michael Loebenstein has put together in collaboration with her take us back to the original order of things: out of the catalogue and into the cinema. © Barbara Wurm and the Austrian Film Museum 2006. Cannot be reprinted without permission of the author and editors.